Stem Cell Factor (SCF) in vitro SimpleStep ELISA™ (Enzyme-Linked Immunosorbent Assay) kit is designed for the quantitative measurement of SCF protein in Human plasma, serum and cell culture supernatant samples. SCF is the ligand for the receptor-type protein-tyrosine kinase KIT. SCF is expressed in fibroblasts, liver cells, Sertoli cells, endothelial cells, neurons, macrophages, oocytes, Schwann cells and numerous carcinoma cell lines. SCF can be found as a cell membrane protein or as a soluble protein after secretion due to proteolytic processing in the extracellular domain. Both forms have growth factor activities; however the membrane form is also important for cell-cell adhesion and interaction. Soluble SCF is a heavily N- and O-glycosylated protein that exists as a non-covalently linked homodimer or as a heterotetramer with its receptor. Binding to the receptor, results in KIT activation by autophosphorylation. This leads to multiple signaling cascades (via AKT, GRB2, RAS, MAPK amongst others) that are important in the regulation of cell survival, proliferation, hematopoiesis, stem cell maintenance, gametogenesis, mast cell development, migration, melanogenesis and neurite-inductive activity of dorsal root ganglia neurons. Genetic defects in SCF are the cause of familial progressive hyperpigmentation (melanosis universalis hereditaria). SCF has also been involved in other conditions such as mastocytosis, mast cell leukemia, myeloid leukemia, aplastic anemia and gastrointestinal stromal tumor. Our Abpromise guarantee covers the use of ab176109 in the following tested applications. Example of SCF standard curve in Sample Diluent NS. Example of SCF standard curve in Sample Diluent 50BP. 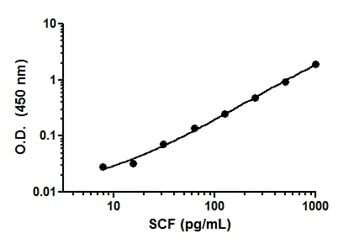 Example of SCF standard curve in 100% cell culture media. Frequency histogram of SCF levels in serum of individual normal healthy donors. The levels of SCF in serum samples were tested from ten individual healthy donors. Levels were interpolated from the standard curve in Sample diluent 50BP and corrected for sample dilution. The levels of SCF are shown for the percentage of individuals within each 100 pg/mL bin center of the distribution. The mean level of SCF was 330 pg/mL with a range of 185 to 498 pg/mL and a standard deviation of 82 pg/mL. ab176109 has not yet been referenced specifically in any publications. Publishing research using ab176109? Please let us know so that we can cite the reference in this datasheet. There are currently no Customer reviews or Questions for ab176109.